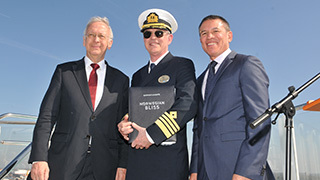 Norwegian Cruise Line took delivery of the 168,028-gross-ton Norwegian Bliss from Meye Werft during a ceremony on 19APR in Bremerhaven, Germany. In attendance were executives from Norwegian Cruise Line, including Andy Stuart, president and CEO; Harry Sommer, executive vice president of international business development; Robin Lindsay, executive vice president of vessel operations for the 16-ship fleet; representatives from Meyer Werft, including Bernard and Tim Meyer, managing partners of the German-based shipyard; and the ship’s captain and hotel director. Before cruising to Southampton, England, to begin her transatlantic journey on 21APR, Norwegian Bliss will welcome her first guests during a two-day European inaugural preview cruise hosted by Andy Stuart and Harry Sommer. Upon her arrival to the U.S. on 3MAY, the festivities for her U.S inaugural tour commence with two-night preview events in New York, Miami, and Los Angeles, and will conclude with a christening ceremony and sailing from her first homeport at Pier 66 in Seattle on 30MAY. Following a three-day inaugural voyage with a call into Victoria, B.C., she will embark on her first seven-day voyage to Alaska. 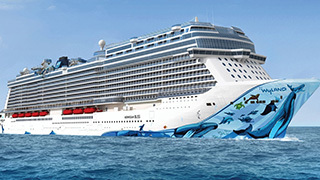 Norwegian Bliss, the third ship in the line’s Breakaway Plus class, is the first cruise ship designed for cruising in Alaska. On board, the ship features some new first-at-sea offerings, including a two-level electric car racetrack, which sits at the top of deck 19. There is also an open-air laser tag course, and the side-by-side Aqua Racer waterslide and expansive Aqua Park, with two multi-story waterslides, one of which extends over the edge of the ship and loops down to the deck below. There are also a number of new specialty dining and bar concepts on the ship, such as the Texas smokehouse – Q, the cruise line’s first full-service Starbucks store at sea, and Coco’s, a sweets shop. There is also The District Brew House, which offers variety of craft cocktails and beers, including local Seattle favourites from Red Hook Brewery. In terms of entertainment, new programming includes the Tony Award-winning Broadway musical, Jersey Boys, and ¡Havana! – an original musical theatre show created and produced specifically for the ship. 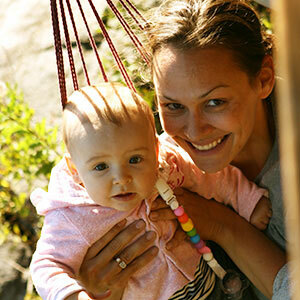 Guests also have a variety of accommodations to choose from, including the luxury suites in The Haven by Norwegian, studio staterooms with virtual ocean views for solo travellers, and plenty of connecting staterooms ideal for large groups and families. Beginning June 2018, Norwegian Bliss will spend the summer cruising seven-day itineraries to Alaska, and the fall season cruising to the Mexican Riviera from L.A. In winter of 2018, she will sail the Caribbean from Miami, and in the 2019 fall/winter season she will cruise from New York City to Florida, the Bahamas and the Caribbean.